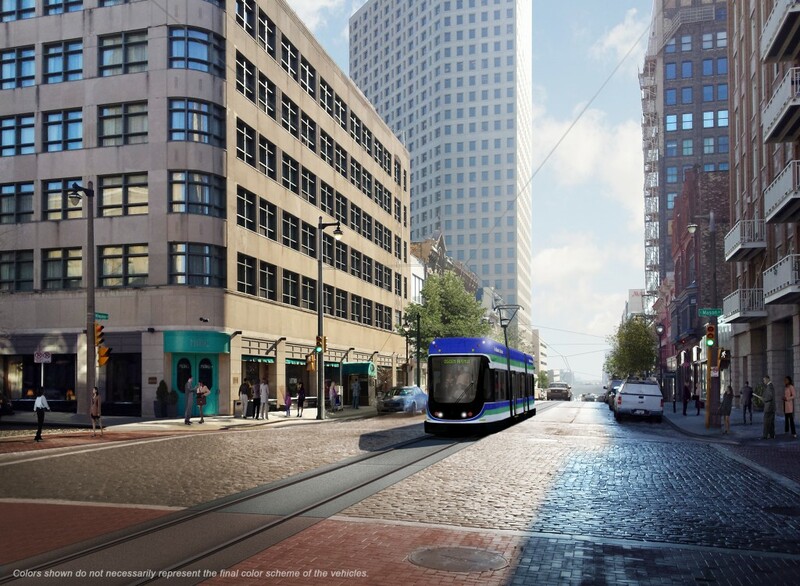 Downtown Milwaukee is the city’s most urban neighborhood running from the lakefront to Interstate 43, and St. Paul Ave to Ogden and McKinley Ave.
1000 North Water Street is a 24-story office building in downtown Milwaukee. Vacant site at the north end of downtown Milwaukee. Office building developed from the shell of the former Laacke & Joys Building. The historic Milwaukee Abstract Association Building and Milwaukee News Building. Downtown Milwaukee office building and parking garage. The 411 Building is a high-rise office building in downtown Milwaukee. 601 Lofts is a ten-story condominium tower on the north edge of downtown Milwaukee. Northwestern Mutual-owned office building at 624 E. Mason St.
Three two-story buildings being redeveloped by David Uihlein into commercial storefronts. 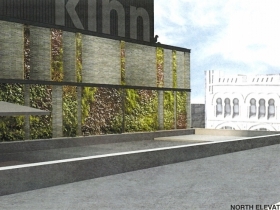 Proposed 30+ story apartment building for corner of Van Buren St. and Kilbourn Ave.
766 N. Jackson St. is a Northwestern Mutual-owned parking lot. Commercial building in Milwaukee's East Town neighborhood. 771 N. Van Buren St. was a Northwestern Mutual-owned mixed-use building. Mixed-use building in Milwaukee's East Town neighborhood. Five-story office building owned by Fiduciary Real Estate. Demolished office building that formerly stood on the corner of N. Van Buren St. and E. Wells St. Apartment tower and parking garage under construction in downtown Milwaukee. Under construction office building in downtown Milwaukee. 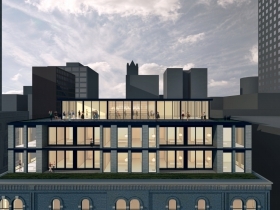 25-story, 328-foot tower by Irgens Development Partners. 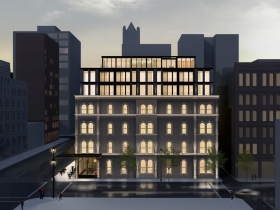 Hotel proposed for 602-606 N. Broadway by Joca Properties. Designed by Vetter Architects. Proposed introduced in March 2019. Sold in early 2014 to Bear Development. Joey Buona’s is a first-floor tenant. Historic church in Milwaukee's Yankee Hill neighborhood. Most significant Roman Catholic cathedral in downtown Milwaukee. The Chase Tower is a 22-story office building in the middle of downtown Milwaukee. Former railway depot on Milwaukee's lakefront. The Colby Abbot Building is a six -story, mixed-use building in downtown Milwaukee. The Comstock building was built by F.G. Comstock. Milwaukee School of Engineering education center that will serve as the hub for the university's new computer science program. Former office building for Northwestern Mutual at the east end of their downtown campus. Canceled condominium proposal by Russ Davis. Downtown Milwaukee office tower at the corner of N. Water St. and E. Wisconsin Ave.
Former church that is part of the Pabst Brewing Complex. Was for a number of years the Forst Keller Restaurant. Clinic to be attached to the Milwaukee Bucks Training Facility. 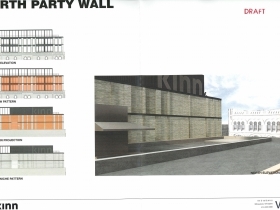 The 30,000 square-foot building is expected to cost $10 million. MSOE student housing facility on the corner of N. Water St. and E. Juneau Ave.
Headquarters for the Hammes Company at 210 E. Knapp St. The Hilton Garden Inn Milwaukee Downtown is a hotel in in the Loyalty Building. The Hollitz Building is a mixed-use apartment and office building in downtown Milwaukee. For sale building that was longtime home to fraternal organization. Historic church designed by Edward Townsend Mix. Recently restored office building located at the intersection of N. Water St. and E. Wisconsin Ave. Historic home on northeastern edge of downtown Milwaukee. Four-story office building on the corner of N. Milwaukee St. and E. Wells St. Sister building Kennedy II sits across Wells. The Kern Center is an athletic and wellness complex owned by MSOE. 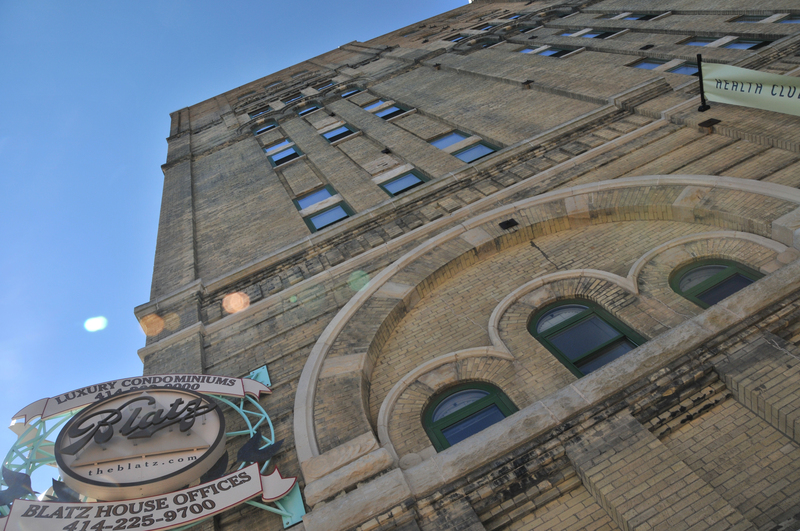 The Mackie Building is a historic office building in Downtown Milwaukee. Historic structure to honor veterans that also includes offices and the Milwaukee Art Museum. The Milwaukee Federal Courthouse is an iconic Romanesque structure located on E. Wisconsin Ave. The Milwaukee Marriott Downtown is an under construction hotel in Milwaukee's Juneau Town neighborhood. Historic office building in Downtown Milwaukee. The MSOE Athletic Field and Parking Complex is a university-owned parking garage with a soccer field on top. 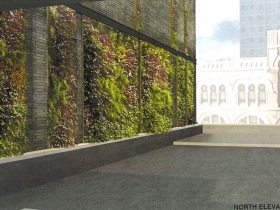 An under construction 32-story office tower to replace the 16-story building located near the corner of Mason and Cass streets. 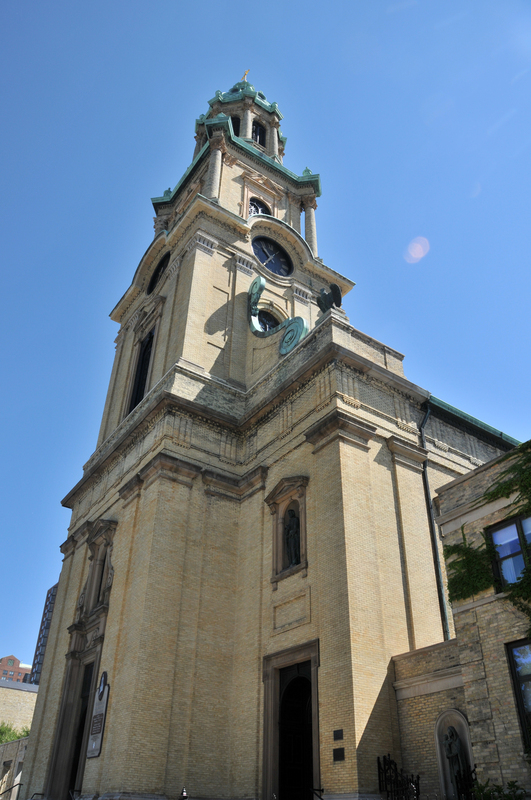 Historic Milwaukee church located downtown. The Pfister Hotel is the most iconic hotel in Downtown Milwaukee. Originally referred to as the Herman Building. The Blatz is a mixed-use building in Milwaukee's Juneau Town neighborhood. 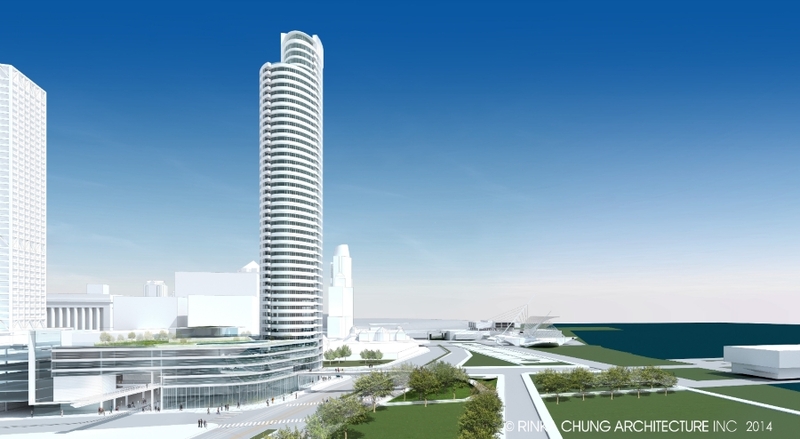 Proposed 44-story building for Milwaukee's lakefront. The Westin Hotel Downtown Milwaukee is a 200-room hotel located immediately south of the US Bank Center. Nine-story off building in downtown Milwaukee. University Club Tower is a residential high-rise in Milwaukee's Juneau Town neighborhood. The US Bank Center is the tallest building in the state of Wisconsin. Van Buren City Lofts is a residential condominium building on the north end of downtown Milwaukee. The building contains 38 units. The building is the former garage of the Luick Ice Cream Company. It was converted in 2002. During conversion to condominiums, an additional floor was added to the building. 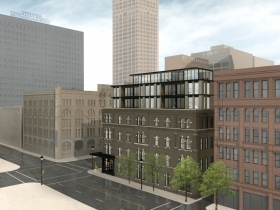 96-unit apartment building under construction in downtown Milwaukee. The Wells Building is a 15-story historic office building in downtown Milwaukee. The Wisconsin Gas Building is a historic office building in Downtown Milwaukee famous for its rooftop flame.